Houses & Homes VA: Think that you’ll NEVER have a home fire? That’s your first mistake. Think that you’ll NEVER have a home fire? That’s your first mistake. Regardless of how careful you are there is still the possibility that you will experience a house fire at some time in your life. There are many different causes for fires in the home and there is no possible way to avoid each and every one of them. This being said most of these tragedies can be avoided with a few simple prevention methods and some common sense. Here are some great tips to help you avoid becoming a victim of fire and what to do if all else fails. Keep a Fire Extinguisher in the Home – I have seen a lot of homes and it is true that most people do NOT own a fire extinguisher. There are different types of extinguishers designed to fight different types of fires. I suggest buying the 2 most commonly used types of extinguishers. The first is designed specifically to fight grease fires in the kitchen. Using a general purpose type extinguisher (or plain water) will actually make a grease fire worse. This extinguisher is small and easy to use and will eliminate a grease fire in seconds. The second type you should own is the general type extinguisher that is designed to put out a “general” type fire such as wood, paper and so on. Fire extinguishers are available just about everywhere and they are very reasonably priced. There’s really no excuse not to have both types just in case. 1 for each floor of your home is an even better idea. Be sure to maintain them as required. Many extinguishers have an easy to read gauge built into them. When the needle gets close to the “red zone” it is time to have the unit recharged to ensure that it is ready when you need it most. If you need to fight a fire with the extinguisher stay back about 6 feet from the flames and aim the nozzle at the base of the flame, not in the middle or top. Sweep the nozzle back and forth and if you’re losing the battle get out immediately. 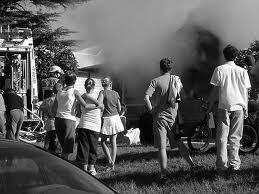 Many homeowners are injured when battling a blaze because they don’t know when to quit. Extinguishers are made for small fires in the beginning stages only. A good rule to remember is this: if the fire is not getting smaller it’s time to go, period. Believe it or not there are still many homes that either don’t have smoke detectors or have too few. In addition the homeowners don’t take the time to test them regularly to ensure that they are working as they should. If you are not sure how many detectors you need, where they should be located or how and when to test them, get professional advice. At bare minimum you need smoke detectors to protect the bedrooms, right? But what about if a fire starts in the basement or garage? Free advice is as close as your local fire station or telephone. Be sure to place those “special” stickers on the windows in the children’s rooms. We’ve all seen them before; they’re the brightly colored decals that inform firefighters which bedrooms belong to the children. Ask any fireman (or woman), they work. Be sure that you have an escape plan in the event of an emergency and that everyone in the house understands it. It should include evacuation routes from every room and a meeting place away from the home. This is extremely important because you need to know if anyone is still in the home. We’ve all heard the horror story about the mom or dad that didn’t survive because they went back into the home in search of a child that had already escaped. The meeting area can be anything, that tree at the end of the driveway, the neighbor’s lawn, any place that is a safe distance from the fire. Finally, make sure that everyone in the home knows how to notify authorities and each other in such an emergency. Manually triggered fire sensors (such as may be part of your home security or fire protection system) should be made a part of your evacuation procedure as well as a way of notifying others of the situation such as knocking on bedroom doors and simply yelling “FIRE!” as loudly as you can. This is one time that waking the neighbors is a good thing.